A new device from from high-end video camera producer Red has been announced, that if promises are kept, will be the first holographic display-equipped smartphone not requiring users to wear glasses or headsets for fill three-dimensional content viewing. As with the initial Radeon Pro release with the 2016 MacBook Pro, Apple hasn't provided that much detail on the same family of GPUs used in the new iMacs -- but AMD has shed some light on the new processors, showing a radical improvement over the predecessors. The LG UltraFine 5K display is beginning its slow march back to availability, with shipments of the improved model leaving Apple warehouses on March 7 -- but some users with the monitor now are still hitting roadblocks in trying to get the situation rectified. Shipping estimates for LG's UltraFine 5K Display, sold exclusively through Apple's retail network, have slipped to over a month as the Korean company issues updated hardware with better RF shielding. Thunderbolt 3 LG UltraFine 5K displays boasting enhanced shielding to prevent radio frequency interference disconnects and crashing are working their way to retailers now, and problematic units in the field will be assessed for service and shielding addition on a case by case basis, AppleInsider has learned. After delving into the cause of wi-fi router interference, LG has redesigned the shielding on future production batches of the Thunderbolt 3 UltraFine 5K display -- but not only may this not directly address other user's connectivity complaints, how existing monitor owners will get the problem fixed is not yet clear. A Wi-Fi-related issue with some LG UltraFine 5K Displays has possibly been discovered, one that effectively renders the high-resolution Thunderbolt 3 displays unusable if an afflicted unit is positioned within a few feet of a router or a wireless access point. Shipping times for the LG UltraFine 5K Display have dropped precipitously in the U.S., with outstanding orders being updated, and new order shipping estimates falling from 2-4 weeks, to just one week. Announced in tandem with the 2016 MacBook Pros, LG's 27" UltraFine 5K Display was developed in partnership with Apple. 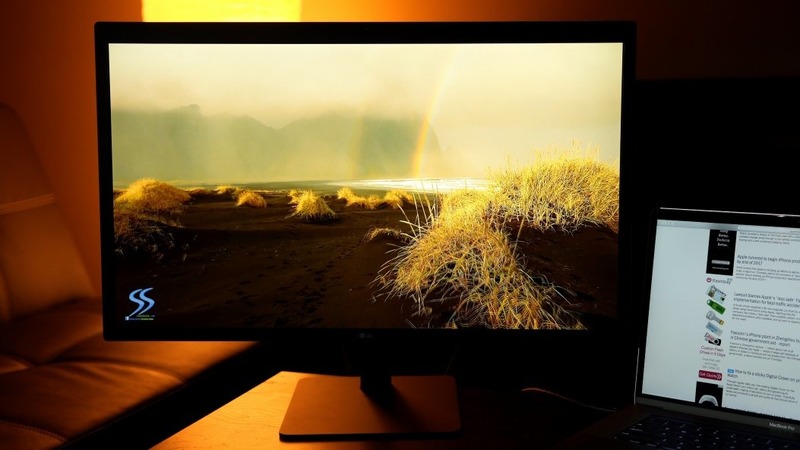 Despite a modest design, the monitor's color accuracy, brightness, contrast and sharpness make it a worthy successor to Apple's defunct Thunderbolt Display. Apple this week started deliveries of LG's hotly anticipated UltraFine 5K Display, a monitor developed to complement Apple's new all-Thunderbolt 3 MacBook Pro lineup. AppleInsider goes hands-on with the device in this first look video. With the first preorders now arriving in the hands of customers, AppleInsider offers a closer look at LG's gorgeous 27-inch UltraFine 5K Display, featuring Thunderbolt 3 connectivity to take advantage of Apple's latest MacBook Pros. In support documents for the forthcoming LG UltraFine 5K Display published Tuesday, Apple notes older Mac models, including 2013's Mac Pro, can be used at 4K and lower resolutions when connected via a Thunderbolt 3 to Thunderbolt 2 adapter.